Zippered hoodie, custom printed or embroidered in bulk. Our zippered hoodie is made of 8-ounce, 50/50 cotton/poly pill-resistant fleece, and provided with Single-ply hood with grommet and dyed-to-match drawcord, Spandex in 1 x 1 ribbed cuffs and waistband, Seamless body with set-in sleeves, Kangaroo-style pockets, Double-needle overstitching on neck, armhole and waistband. Sizes Available: S-3XL We also supply blank (not custom imprinted) wholesale zippered hoodies: contact us. 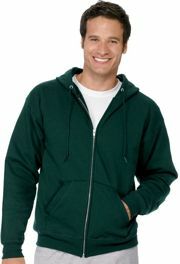 Budget Prices in the USA and Canada for wholesale zippered hoodie . American clients pay no taxes, Canadian clients don't pay PST. We will send you a proof for your approval before production. Unit Prices in the top row of prices below, include the Hoodie and 1 Color Custom Imprint in one location. Add the amount shown in the second row of prices for each additional imprint color at the same location. Add the amount shown in the third row of prices for the first imprint color at a different location. *Please add $4.00 for each size above X-large. Setup Charge: $30.00/color per location. Unit Prices below include up to 10,000 stitches of embroidery and digitizing in 1 location. Thread setups are free. - 8-ounce, 50/50 cotton/poly NuBlend pill-resistant fleece, Single-ply hood with grommet and dyed-to-match drawcord, Spandex in 1 x 1 ribbed cuffs and waistband, Seamless body with set-in sleeves, Kangaroo-style pockets, Double-needle overstitching on neck, armhole and waistband.